Squarespace is a great choice for nonprofits looking to build a great website that’s functional, visually appealing, and easy to manage. Like other website builders, Squarespace requires no coding knowledge (although you can edit your Squarespace site using CSS too). Squarespace offers an array of beautiful templates which instantly command attention. The templates are also mobile-responsive which makes them look great on phones and tablets. 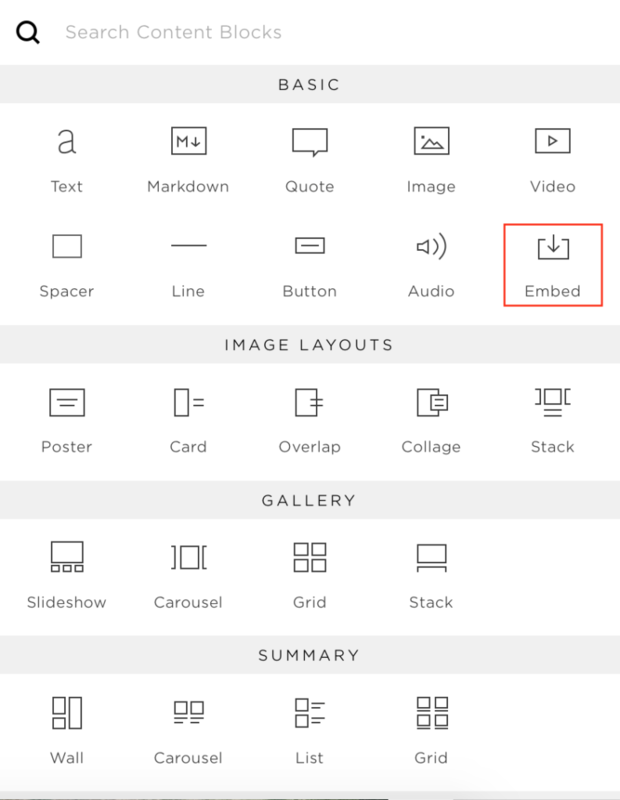 Squarespace’s Style Editor gives you full control over fonts, colors, image opacity, sidebar width, background images, sizes, and spacing of pretty much anything on your Squarespace website. On the other hand, Squarespace doesn’t offer a built-in solution for recurring or subscription donations (weekly or monthly or quarterly or annual). And it has limited data collection capabilities. However, every nonprofit organization needs a robust online donation platform that can support recurring donations, as well as custom data collection. Donorbox is the perfect solution. Donorbox is a powerful fundraising software that is simple to set up and seamlessly embeds into your website. It features a cutting-edge donation system that attracts recurring donations (which we all know is the bread and butter of nonprofits)! Donorbox features a fast, multi-step checkout and integrated employer-donation matching. You can also add a donation thermometer and so much more. Donorbox’s embeddable donation forms support donor-controlled recurring donations(weekly or monthly or quarterly or annual). Donors can enjoy a variety of payment methods (card payments, ACH, PayPal)). And you have access to Donorbox’s powerful custom form builder. 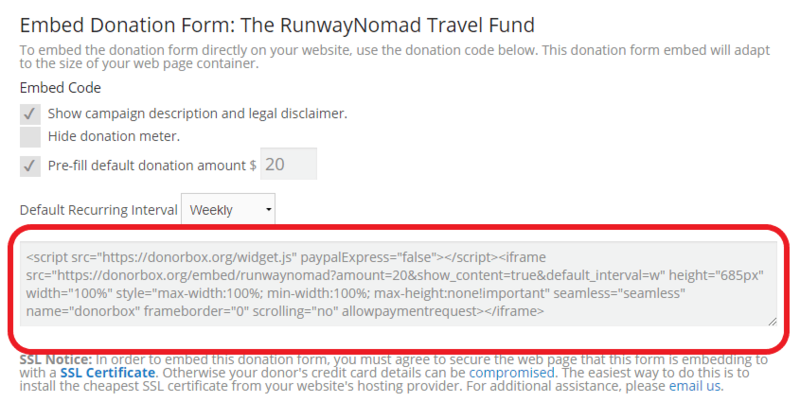 Instead of embedding a donation form on your Squarespace page, you could install a donate button instead. This button will show on your web page. When a donor clicks it, a Donorbox donation form will pop up on the screen. Unlike PayPal, you can add an embedded form directly to your Squarespace site so your donor won’t have to leave your page. This is known to increase conversion rates – more website visitors end up donating if they don’t leave the site. 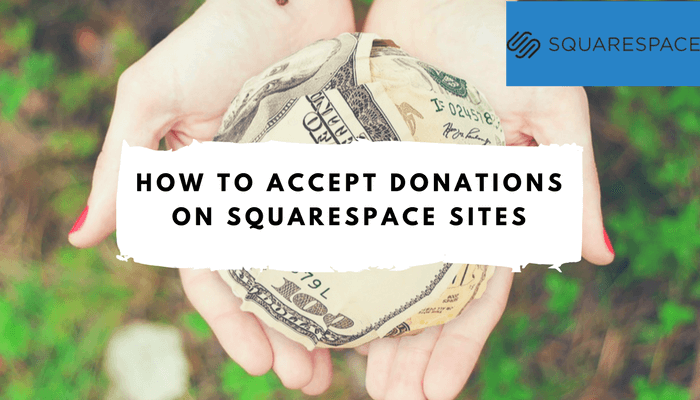 Follow these step-by-step instructions to receive donations on your Squarespace site. If you prefer, you can watch our integration video guide — it will walk you through the donation form integration process in just under 2 minutes! Go to your Donorbox dashboard and find the campaign donation form you wish to embed on your Squarespace site. If you don’t have a Donorbox account yet, you can sign up here. 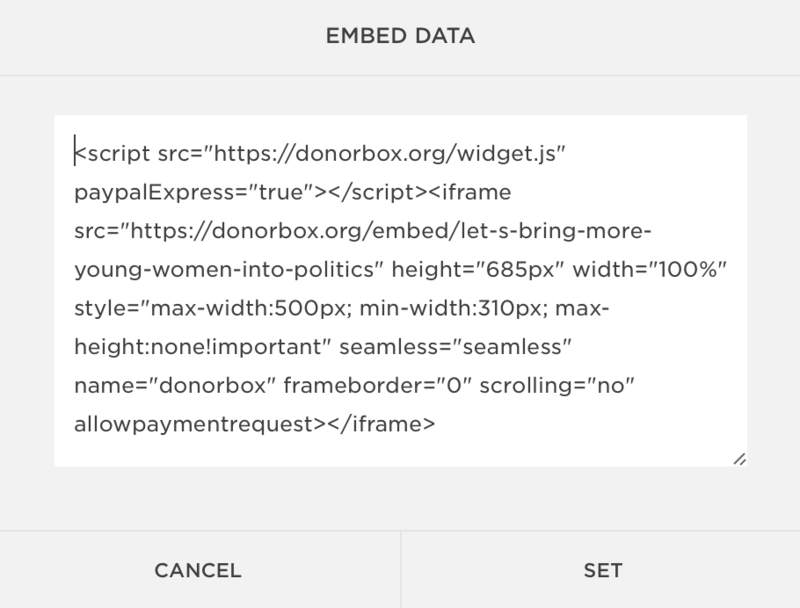 In case you’re new to Donorbox, you’ll need to Create a Donation Form and fill in the required information (Campaign Title, Campaign Details, Form Language, Currency, Form Amounts, Email, Custom Fields, Tracking, and Design). You’ll also need to set up a Stripe merchant account. Click the “Embed Form” button on your Donorbox dashboard. When you’re happy with the settings, highlight and copy the embed code for your form. This code will be pasted in your site later on. Go to your Squarespace Pages editor. Find or create a Squarespace donation page into which you want to embed the recurring (weekly or monthly or quarterly or annual) donation form. 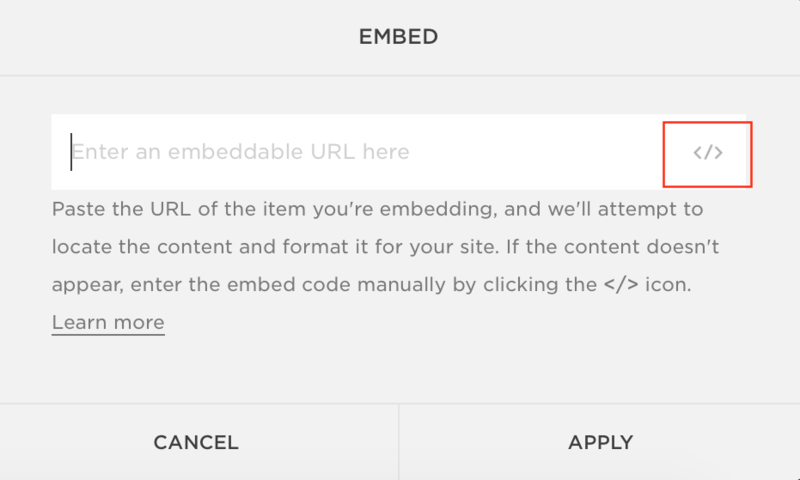 If you already have a page onto which you want to embed the code, click “Edit” on the page’s main content box. To create a new page, click the “+” next to the Main Navigation menu. Then click “Page”. After selecting the title, the description, and the layout, you’ll be able to “Edit Page Content” by clicking on the teardrop-shaped button (see the next step). Click on the teardrop-shaped button inside the text box. This will open up a list of content blocks. Find the embed option and select it. Instead of pasting a URL select the option to insert a block of code. Now, paste the recurring (weekly or monthly or quarterly or annual) donation form embed code (from Step 3) in the code box and click “Set”. It’s time to publish your updated Squarespace website and wait for the donations to start coming in! Squarespace now automatically generates SSL certificates for Squarespace and third-party domains in order to allow your visitors to view your website securely over an https connection. 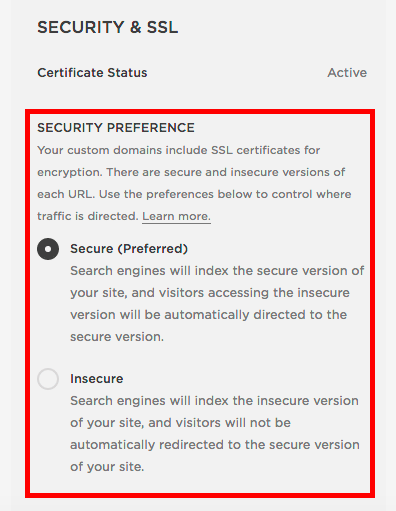 Squarespace offers two different SSL security settings. Be sure to activate the “Secure” setting. To do so, click the “Settings” button on your Home Menu. Then, under “Website”, click “Security & SSL”, and choose the “Secure” setting under “Security Preference” (see image below). Remember, in order to reduce risks, Donorbox requires that a webpage is SSL secured before you can embed a donation form onto it. Use powerful images: We don’t say that a picture is worth a thousand words for no reason. Use captivating, high-quality images on your site – ideally real ones, not stock images. Keep it simple: It’s very easy to overload the donation page with information. Try to keep it simple and minimal, focusing on your “Donate” button. 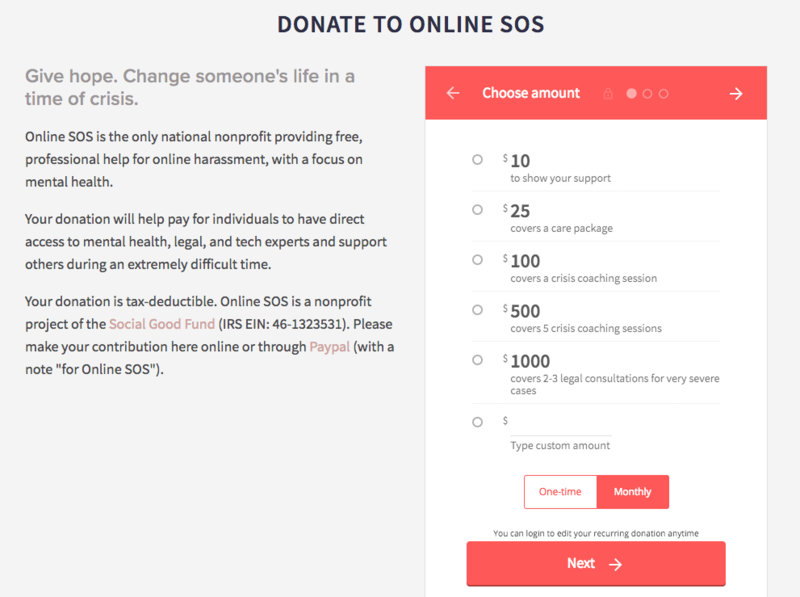 Make the online donation experience a friendly one: There’s nothing worse than losing a visitor to a poor donation page and donation form design. Clearly display your nonprofit’s financial information: Many potential donors seek out financial information for a nonprofit prior to making a donation. Share how specific donations were spent: Send a follow-up email to the donor letting them know how their specific donation was spent. This increases the chances of them donating again. Stay authentic: Maintain personal contact with your donors, including in person and by phone, to make that human connection stronger and more authentic. Offer a “share” option: Encourage your visitors to share your donation page with others. This increases your brand visibility and reach. Make your donation page stand out. All the best with your fundraising!! Hi, We would like to use Donorbox on our Squarespace website, but are concerned about the Squarespace SSL certificate… Even though it is enabled, it doesn’t seem to be 2-way encrypted. Is there another option to reinforce the security level? I am just trying to get some information before I sign up. I have some questions, do you have a phone number. Please feel free to send us a ticket at https://donorbox.freshdesk.com/support/solutions so that we can help you as quickly as possible.